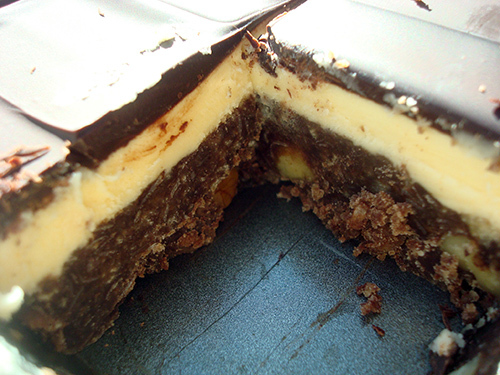 It's a fact: Nanaimo bars are a practically perfect foodstuff. As much of a classic as they are, though, I think I have finally figured out the way to make them better: I ditched the traditional graham crackers in the crust and swapped in shortbread instead. 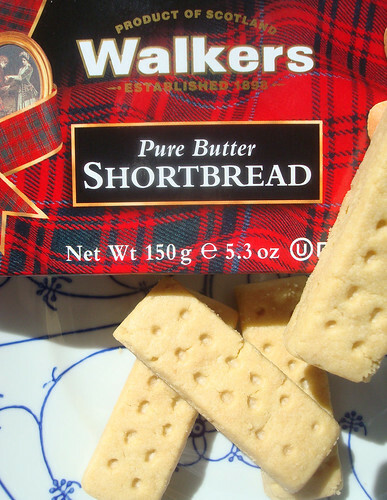 I had the idea for these bars when I was contacted by Walkers Shortbread to make a recipe for their site. They offered to pay me for a recipe and send me samples of the shortbread to bake with, so I figured it had to be a good one. Time to call in the Nanaimo bar aces! 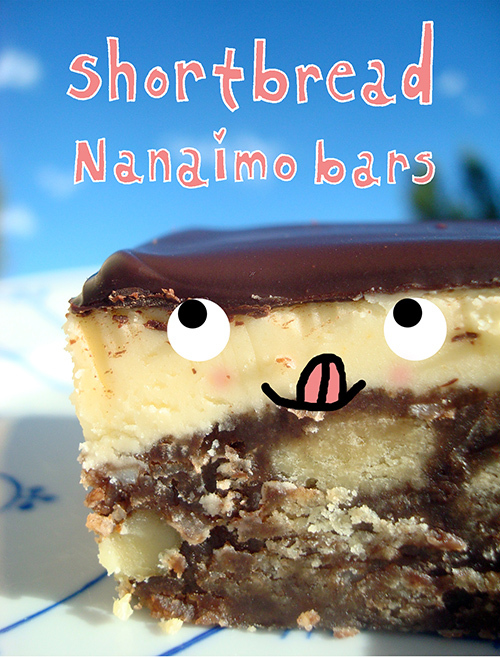 Shortbread and Nanaimo bars: both practically perfect. So what happens when you combine two practically perfect foodstuffs in one recipe? Oh, my word. Amazing things. The crust has a distinct shortbread crunch and touch of saltiness which elevates the bars from great to "omigod how quickly can I eat my weight in these?". Promise me that you will make them, and the sooner the better. You'll thank me, and so will every single person you share them with. Here's how to make this magic happen in your own home. Melt the butter and cocoa in a double boiler until fully incorporated, but do not let the mixture come to a boil. Add the beaten egg and stir constantly until the mixture begins to thicken, less than 5 minutes. Remove from heat and stir in the cookie crumbs, coconut and nuts. 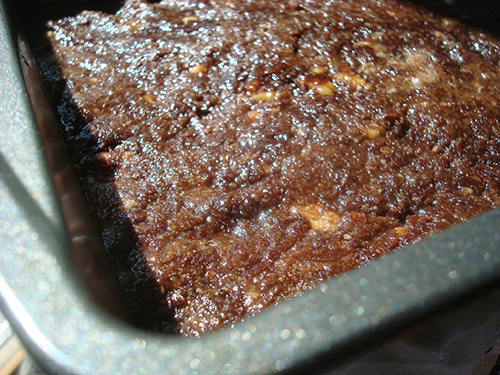 Press down firmly into a greased 8″ by 8″ pan; try to make the mixture as flat as possible in the pan. Let this cool for about 20 minutes in the refrigerator. In a stand mixer fitted with the paddle attachment, cream the butter, cream, custard powder and confectioners’ sugar together until very light and fluffy, 3 to 5 minutes. Spread over the bottom layer, taking care to spread it as flat and evenly as possible. I like using a pastry scraper to do this. In a medium saucepan or double boiler, melt the chocolate over medium heat, stirring often to ensure that the mixture doesn’t scorch. Remove from heat. Let sit until the mixture is still liquid but very thick, then pour it over the second (middle) layer and gently spread it with a spatula to ensure even coverage. 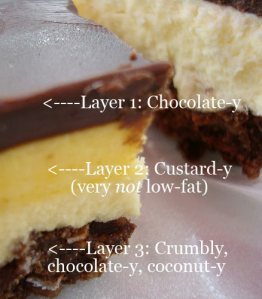 Typically, Nanaimo bars are sliced in fingers rather than squares. You can slice them any way you like, of course (and to prove that point I did them in squares this time because I wanted bigger bars and fewer servings), but for an authentic look, split into eight rows in one direction and six rows the other way, so that they are slightly elongated when sliced. Have you ever heard of a dreamier food than this?